Anyone who knows me well knows that I have a weakness for period films. Particularly during the Victorian and post-Edwardian period. Lately, I am interested in the events during the First World War–did a bit of reading–and would love to read more. I came across this book, Testament of Youth, on which this movie is based. 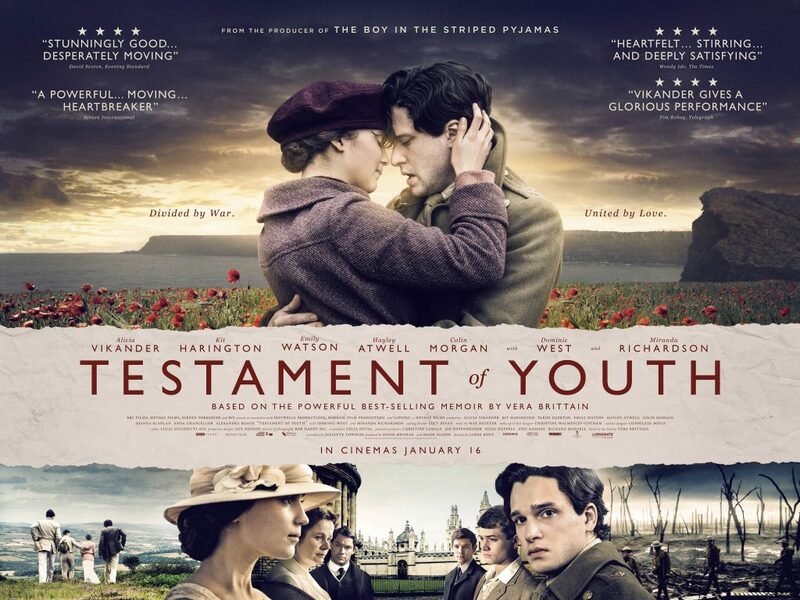 Testament of Youth is the story of a real-life young woman named Vera Brittain, who worked as a Voluntary Aid Detachment (VAD) nurse during the First World War–or the Great War, as it was known then. At the start of the story, Vera (Vikander) struggles to be allowed by her father to attend Oxford. At that time, it wasn’t the done thing for a young woman from the upper middle and upper classes in post-Edwardian England to pursue higher education. Finally, after her younger brother Edward (Egerton) persuades their father to allow Vera to attend Oxford, Vera prepares for the Entrance Examination. She eventually gets in, including her brother and his friends, one of which was Roland Leighton (Harington) who became Vera’s fiance. Their peaceful world was shattered when England declared war against Germany. Vera’s brother Edward went to war, as well as his friends Victor (Morgan) and Roland. Vera ended up going to Oxford alone, but after seeing some hospital beds and nurses within the university vicinity, Vera, despite the resistance of her tutor, signed up to be a VAD nurse. Tragedy met Vera three times. Her fiance, Roland was killed in 1915, her friend Victor in 1917, and finally her brother Edward, in 1918. Vera returns to Oxford, continuing what she left. There she meets Winifred Holtby, and was encouraged by Winifred to “get up, get dressed and eat.” Vera and Winifred became firm friends–I read somewhere that they remained so until Winifred’s death in 1935 due to renal failure. One scene in particular, moved me so much that I memorised what Vera said. It was that scene where Vera was at a meeting or talk of some sort with the question: Should Germany Pay? After being mocked slightly, she delivers this speech. I only managed to memorise part of it, and I do think that even in this day and age, it is still applicable. “It was their hands too that I was holding. Their pain was the same pain–their blood is the same blood. Our grief is the same grief as the grief of hundreds of thousands of German women and men. I speak to those of us who are left behind. The mothers, sisters, women–we sent our men to war–I fought my father to let my brother go. Because they think it’s the right thing. The honourable thing. Another thing that has captured my interest is the scenery. I don’t know why, but it was magical to see those wild, green moors, the coves, and the sea. Oh, and the University of Oxford! To me, the locations are characters of some sort, as it gives the atmosphere, and it sets the tone of the story–or the movie, rather. And they did, very well. Has any one of you seen the movie? How has it impacted you? Previous Post Friday Feature: To all the books I’ve loved before.